It's beginning to look a lot like Christmas....not only one of my favorite Christmas songs....but oh so true when you Shimmer things up! 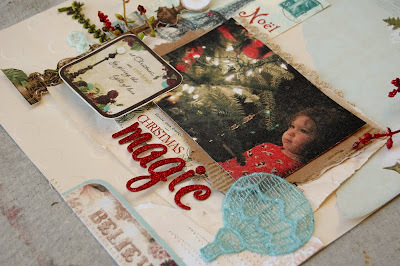 When I saw Dena's idea for using Shimmerz Spritz on her photo paper before printing I was hooked and had to try it for myself....thanks for the awesome inspiration, Dena!!! 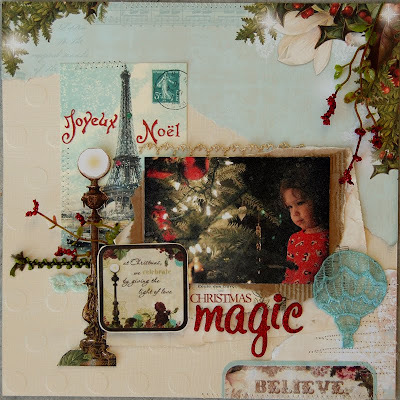 Some gorgeous papers from Webster's Pages - Winter's Wings made a perfect backdrop for my photo....which was a little blurry, so I love the 'little lights' effect that the Shimmerz created. I used Epson Matte Presentation paper and spritzed with Baby's Breath Shimmerz Spritz and let it dry completely and then printed my photo normally with my ink jet printer for this fabulous effect. Hope you have a Shimmery Christmas! This layout is just beautiful! Everything is just so perfect together. Happy Holidays! What an absolutely stunning layout. I love the texture, the colors, the...well everything. WOW!!! What a beautiful page! Great job totally love it! Completely and totally gorgeous! It's just stunning!!! Wow! What a beautifull LO! I love it! And i love the Webster Pages! Great job and so inspiring! You are SO inspiring to me!! I ADORE your creation. GORGEOUS work!! What a great tip! Awesome look - thanks so much for sharing it!